The nameplate reads: Avery Londini Fecit 1793 St. Margarets Church Yard. 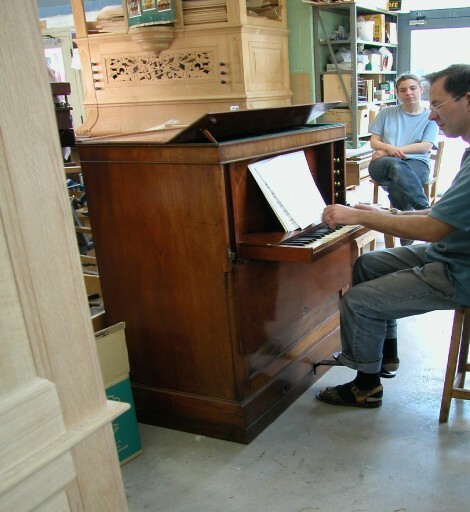 It is a bureau organ of a type apparently unique to John Avery, shaped like a small upright piano, with a mahogany case. The bellows and windchest are low in the lower case, and the keyboard is attached to the inside of the front panel of the upper case, folding down and engaging with backfalls and stickers. Mr Simon Elliot and his mother donated it to the Trust, Gibside Chapel, in 2002, https://www.nationaltrust.org.uk/gibside. Mr Elliot recalls that the organ was in his Mother’s house ‘near Alderley Edge’ in his childhood. Before that time it belonged to her father, Edward Ashworth Radford, who was the MP for South Salford 1924-39 and Rusholme 1933-44. His dates were 1881-1944 and he lived at ‘White Gables’, Wilmslow. He was the son of George Radford of Manchester and Church Stretton. The Elliotts loaned the organ to Manchester City Council, so it must have been the one recorded at Heaton Hall in 1978 (NPOR). The final resting place before Gibside was Mr Elliott’s house in Westmorland. The organ was cleaned by R. Johnson for Jardine and Co of Manchester in 1975 according to an inscription in the bellows. It was restored by Timothy McEwen at Welbeck in 2003.